I call this my Jetsons top. I have no idea why but it just reminds me of the famous cartoon. It’s probably because of the sleeves, although I doubt Judy Jetson had spikes on hers! What attracted me to this top was actually it’s color. It’s just so cool and fresh!. Since this top looks quite playful and young, I went ahead and styled it that way too. I made it even more playful by adding a neon pink collar necklace, which in my opinion is what actually held the whole look together. Obviously, this top isn’t for everyone. 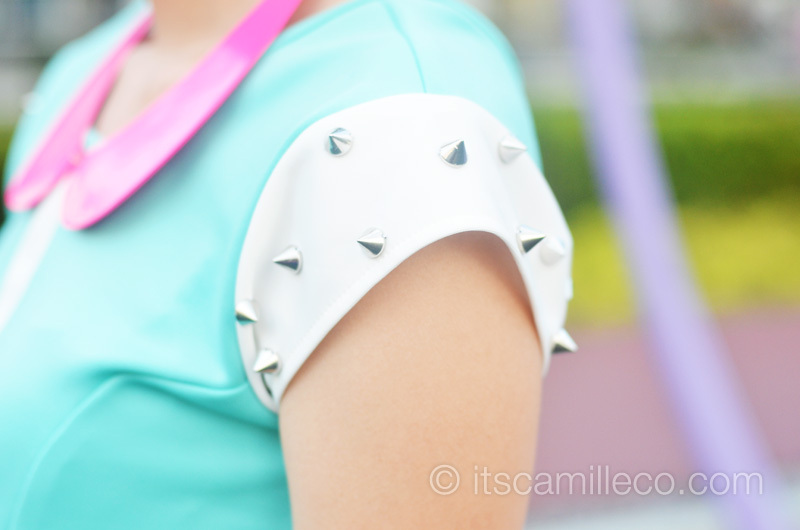 First of all, it’s color isn’t exactly the safest, it’s cropped; and it has spikes on it too. It’s quite adventurous but that’s the beauty of it. I love that there is a homegrown brand like Apartment 8 that offers designs like this. Yes, it may be out of the box but as I always say, it’s all about the styling. Imagine pairing it with a high-waist midi pencil skirt for example. It can actually pass off as business casual, right? 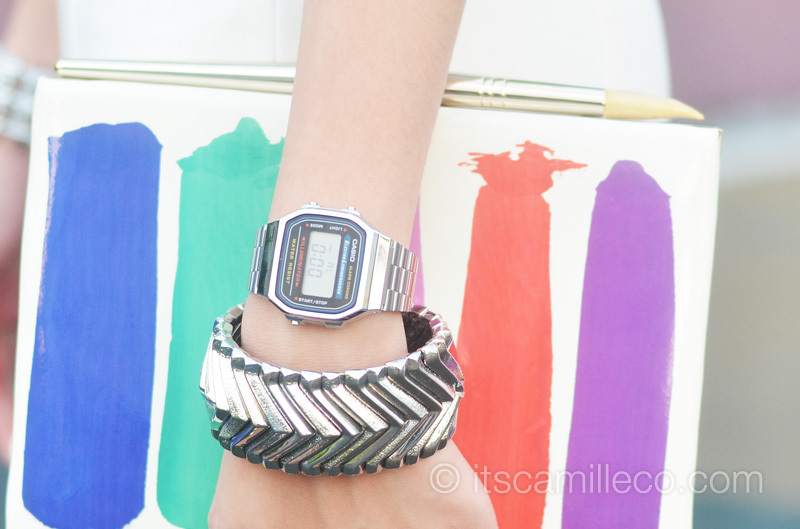 Hello Camille, did you bought the Watch Factory Casio watch here in the Philippines? if not, where? how much does that watch cost? so so yummy! the colors blend perfectly..
your kate spade clutch is my favorite! wish i could have them! Very nice colors! The colors were very light yet you can still manage to style it that way. Indeed, a very unique outfit. Alam mo ba Ate Camille, I got really inspired by your looks. Kaya..
Haha yes! This is my sister’s :) Thank youuuu! I love your top, subrang dalang lang akong makakita ng ganyang shirt. You’re so LOVELY. just curious…could we get a glimpse of your closet? Nice background too, where is that? The outfit is fresh and playful but still stylish. Love it! BTW! Where was this photo taken? I love the top so much but wouldn’t be able to wear it, i gave birth twice and couldn’t get rid of this stretch mark. tsk3! Awwww at least you have a happy family! :) More than makes up for it! I love this look so much!!! <3 Hee! The colors really popped! I love it when you dress up like this. Very young and vibrant. Lakas maka-fresh! Haha. I’m so taking your advice on stepping out of our comfort zone! This look I love, especially because it’s young and fresh! (And for that awesomesauce advice there at the bottom!) I remember this bag of your achi as well! Did you ask permission from her this time, Ms. Camille? I hope you could have an outfit post with her next time! Thanks Kyla! :) I did so she reluctantly lent it and warned me if I get scratches on it, she’ll kill me haha! i mean u don’t “try to blog” anymore,ur a pro blogger now!! I love you too…. AY! #sweet! This makes me think of cotton candy! Love the colors Cams! :) So pretty as well how it turned out. omg . the top is so cuuuute ! i want one . i wonder how you can afford all those clothes . haha ..
You have legs for days! I love everything about this look, especially the high waisted shorts and the spikes on your top! Hi I emailed you! :) You’ve got a lovely look there. The clutch is soooooo ahhh!!!!! Haha your sister’s, right? Yes it is :) Thanks Mikha! indeed the pink necklace held the look together and the clutch which belongs to your sister if I’m not mistaken :) curious lang po ako, saang event nyo po ito sinuot? I visit her blog from time to time. She’s got quite a collection!